I’ve started designing a product in the Salesforce Lightning System. There is nothing extraordinary about it. It’s a perfectly reasonable design language, similar to Google Material in many ways. Of course, there are a few things I wish they could improve. How could I use a tool or system and NOT have requests? Have you just met me?? Why do people feel like they need to invent a custom font? There are plenty of free fonts out there. The big problem is that tools like Figma support Google Fonts. I can make a prototype in any Google font and know it will show up correctly. If I use Salesforce Sans, I am screwed. It doesn’t show up. Luckily, I can choose an alternative font that looks nearly the same. Roboto or Work Sans are very close. See comparison below. Notice how they are slightly different widths. Now, if you asked me simply which I prefer, I probably would prefer Work Sans, then Salesforce Sans and then Roboto. I’m not a fan of thin kerning on fonts, especially for numbers. However, this is besides the point. I don’t want to force people to download my fancy font. 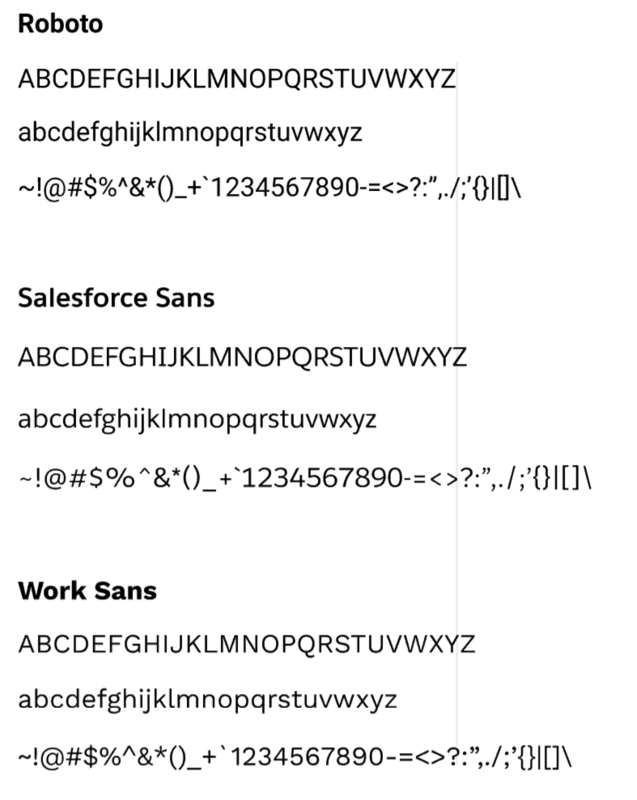 If Salesforce wants to be “extra” with their font, they should open source it and get it hosted on Google Fonts. Stop making me jump through hoops. Salesforce has this super deluxe site, but its mainly geared for developers, not designers. They have UI Kits for Sketch. Unfortunately, I don’t use a Mac and therefore do not use Sketch. I use Figma. Here is the weird situation. Not many designers focus on Salesforce as a platform. I actually have never met another person who is doing this. I have a suspicion that a high percentage of them don’t use Sketch. I could be wrong, but it seems like they need to deliver more instructions on the website. Font sizes, line height, spacing, etc etc. Give me instructions and I will try and follow them. Material design is a language with alot of movement. Lightning is static and kinda ugly. The controls do the bare minimum to get by. It’s just a little uninspiring as a designer. Some people might say “It’s Salesforce, DUH!” but I think that’s a cop out. There are alot of talented people over there. I know they have alot to do, but if winning the hearts and minds of designers and developers was easy then everyone would do it. They have the basics. But as example, notice the lack of drag and drop examples. I think Salesforce needs to dig a little deeper into interesting and useful design patterns to give us. Plus, it’s all kinda slow. Its crucial that the UX doesn’t reload all the time. I’ve only been into it two days so I am sure I will find things I like and don’t like as I progress. Have you had to design in Lightning? Let me know. what do you think of https://www.avonnicreator.com/ ?